It's no longer just skiing, hot springs and gourmet food that await travelers to the northwestern Xinjiang Uygur autonomous region. Over the winter, many tourists have been experiencing distinctively local activities developed by travel agencies across the region. For instance, Liu Guohui from Shanxi province and his family had a great time experiencing folk customs at Tianshan Tianchi (Lake of Heaven) in February. He watched a drum beating performance, dragon dancing and acrobatics at the resort, and enjoyed lantern riddles and sweet dumplings. "It really spiced things up, in addition to the beautiful sight-seeing there," Liu says. "The festive atmosphere was what Spring Festival should be like," he adds. The region received more than 3 million visitors over the recent Spring Festival holiday, up 71.3 percent when compared with the same period last year. Tourism income surged 74.4 percent to 3.6 billion yuan ($539.6 million) during the festival. "Travel today doesn't just mean seeing the sights," Ma Li from The China Youth Travel Service's Xinjiang branch explained to China Tourism News. "Travelers need richer form of content," Ma said. The company has organized many themed activities and experiences to ensure travelers have a good stay in Xinjiang. This winter, the agency saw its customer numbers triple compared with the same period of the previous year. Its specialty tours of Jimsar county drew in 5,500 visitors, while the one at Tianshan Tianchi packed in more than 6,000 people over the winter. 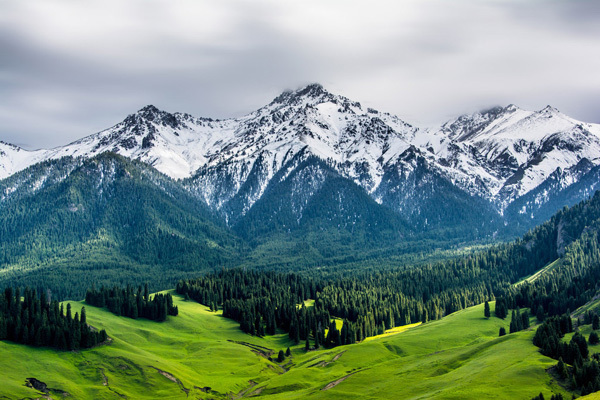 The CYTS Xinjiang agency is just one of the local tourism players that have launched new programs to better cater to travelers' needs. Since mid-November, Urumqi International Train Travel Service has launched four special tourism trains with routes that take in Keketuohai, Altay, Kanas and Ulungur Lake. It's the first time that such train routes have been offered, says Zhang Ronghan, an official with the rail agency. Travelers have been able to experience fairytale-like Kanas and stunning fishing on the ice at Ulungur Lake. For Kanas alone, the number of travelers has more than doubled at Xinjiang Kanas Smart Tourism Co. Most of the travelers are from Beijing, Shanghai, Guangdong province's Guangzhou and Tianjin, says Wu Bin, an employee at the company. Wu's agency has developed programs offering snow carnivals and accommodation at Tuva people's traditional houses during the winter. Travelers have swarmed to the area to see locals engage in fun competitions using skis made from pine and fur, the essential style of which is thought to date back as far as 12,000 years. The active involvement of travel agencies is also partly a result of incentives from local governments at various levels. The Narat scenic spot has rolled out 10-yuan tickets for group travelers who book through local travel agencies, while visitors have free access to skiing equipment and horse racing. To date, Narat has received more than 30,000 visitors, a significant number of whom came from Jiangsu province, Tianjin, Beijing and Hong Kong, according to Che Hua, an official with the organization that manages the scenic spot. The Altay government has granted subsidies to tourism attractions and hotels that opened through the winter season. There was also a monetary incentive for the top six travel agencies who sent the most travelers to Xinjiang. Xinjiang has rolled out nearly 300 cultural tourism events across the region to boost winter tourism, according to the local culture and tourism authority.